Mathematical content knowledge and beliefs about teaching and learning interact in complex ways that, in turn, influence the quality of mathematics instruction and, therefore, are important teacher-preparation program outcomes. 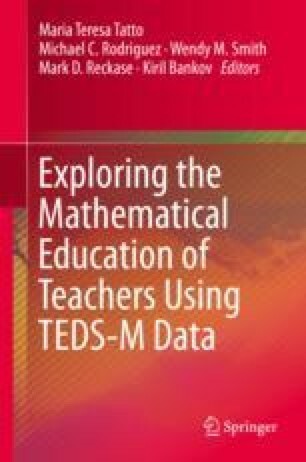 We used the Teacher Education Development Study in Mathematics (TEDS-M) database to study the relationship between future primary teachers’ beliefs about the nature of mathematics, beliefs about learning mathematics, and mathematical content knowledge (MCK) within and between teacher preparation programs across 15 countries. A series of multilevel models were fit to four program groups (lower primary, primary, primary/secondary, and primary mathematics specialists) with future teachers nested within institutions. Confirming our hypotheses, procedural beliefs were associated with lower MCK scores, and inquiry beliefs were associated with higher MCK scores. We hypothesized that endorsing fixed-ability beliefs would be associated with lower MCK scores, but this was only confirmed in some countries and program-types. The chapter concludes with possible explanations for programmatic differences between and within countries, grounded in a discussion of program features such as entry requirements, program-types, and credentials, as well as curriculum organization and content.